As you know, it's that time again to set out to find the vehicle that is the perfect fit. A wagon is what you need but you still want a vehicle that has a sense of style. If this is the situation that you find yourself in, then the new Audi A4 allroad may be the right vehicle for you. Whether for work or play, vehicles play an integral role in how you go about your day. 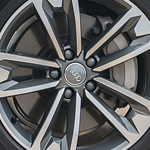 With the Audi A4 allroad, this role is filled with a well-designed vehicle. When seated in the driver's seat, you are greeted well thought out dash with an available 8.3-inch MMI infotainment display. This center high mounted screen makes a variety of information easy to view or access. When you need to move cargo, the 40/20/40 split rear seats gives you options in expanding the cargo space that is already available in the A4 allroad. Regardless of what you have to squeeze in, the A4 allroad more than likely has you covered.